Although he remains hugely popular in his native Nigeria, it’s been more than a decade since King Sunny Adé’s heyday in America. Adé’s last album release here, Seven Degrees North, was off the market since 2000 (it was recently re-released). But that hasn’t stopped a litany of Western artists from digging into his immense catalog of juju music for inspiration. Any fan of bands like Foals, TV on the Radio, Vampire Weekend, and Animal Collective has heard Adé’s influence. Dirty Projectors’ recently released album, Bitte Orca, features plenty of the multipart vocal harmonies and dissonant guitar that have been hallmarks of Adé’s sound over his 42-year career. Phish guitarist Trey Anastasio once cited Adé’s use of “a lot of people playing small parts that are intertwined together” as a major influence. So it was with great anticipation that the 62-year-old guitarist and bandleader played a set at the Independent in San Francisco. 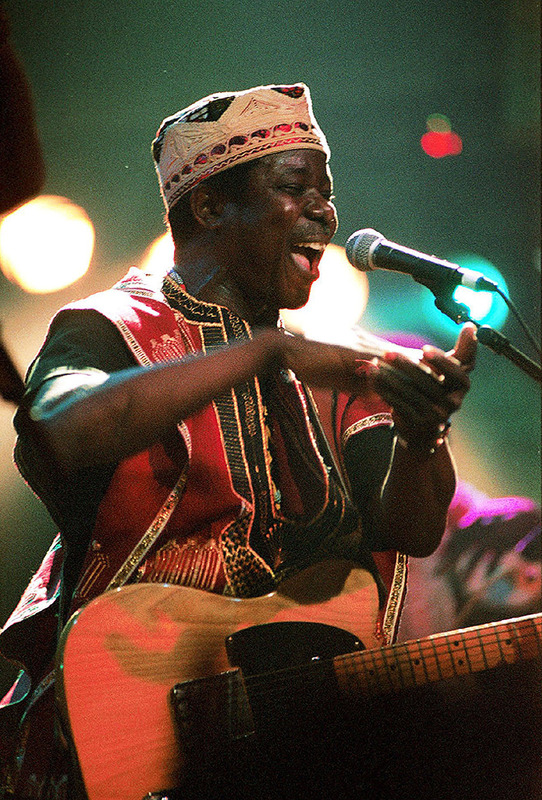 His 12-piece backing band strode on stage and proceeded to dive into a beast of a rhythm, driven by a sea of dunduns, or “talking drums.” Looking years younger than a sextagenarian, Adé immediately led his group through one of the hallmarks of juju music: A lengthy, multipart a cappella harmony, sung in Yoruba, with an unmistakable cadence of short bursts followed by long verses. During many of the a cappella sections, which were the set’s mainstay, Adé and his fellow singers would act out choreographed dances and mime acts like passing food to one another. The only sign of Adé’s age—he’s released a mind-blowing 120 albums in his career—was the fact that he only picked up his axe once during the two-hour set. But when he chose to do so, as he was joined by two Nigerian dancers with superhuman powers in the gluteus maximus department, his playing was light and crisp. The crowd was treated to a set that was the perfect mix of sweet and savory. The harmonies were about as sweet and upbeat as you’ll ever hear, while the massive wall of percussive and rhythmic sound, accented by lead guitar and keyboard flourishes, provided plenty to chew on. The sonic palate was sated.